Home » Blog » Should You Quit Your Job To Prepare For CAT? 'Should I quit my job to prepare for CAT'? Like many other questions, the answer to this question is also – 'It depends.' There are plenty of factors and alternatives that you should consider before you take a call on whether to continue with your job or not. More often than not, this is the most important factor in decision-making. Some CAT aspirants look at CAT preparation as an excuse that would legitimize their decision of quitting their job. Please do not quit your job just because you do not like it. 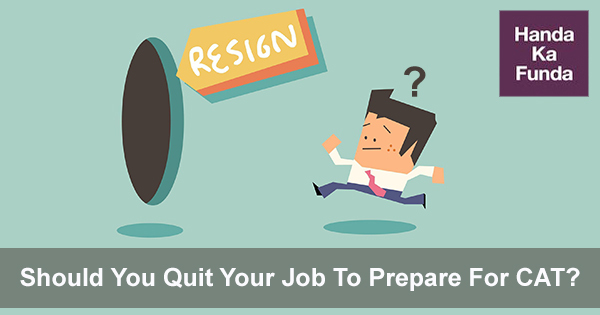 It is understandable if you are bored with what you do, or you hate your boss, or you feel undervalued by the company – quitting your job to prepare for CAT is not the answer in such a situation. You might be compounding on your problem by doing so. So, no – you should not quit your job because of this. 2. Does your job never end? There are some workplaces that stick to the timelines mentioned on the offer letter whereas there are others for which the entry time is fixed at 10 but the exit time could be 7 PM or 9 PM or 11 PM. Also, you are expected to respond to your emails on the weekend and the boss feels Whatsapping you at 10 in the night to send you a presentation. Not only he feels comfortable with that, he also expects a response. The solution to this problem is not to quit your job but to set appropriate boundaries. Quitting your job is not the answer here as well. 3. Is the job stressing you out? While the hours of the job are not a problem and the boss is also a nice guy – it is the nature of the job that stresses you out. Maybe you are always under the pressure of deadlines and are unable to think straight. Even when you are watching a movie with your loved ones, the only thing that you can think of is about a notification from slack or jira or one of the 1000 other tools that are supposed to increase 'work productivity.' Well, in this case also – the problem lies with you and not with the job. You will need to work on your time management skills because these issues are going to be there in most other jobs as well. Quitting your job is a bad idea in this situation as well. This is another problem that a lot of office goers face. They live on one end of the city and they work at the other end. Sometimes, it takes them well over an hour to reach the office. This supposed 'wastage of time' motivates a lot of people to quit their job and perhaps utilize the extra time they will have to prepare for CAT. Well, with online CAT coaching courses like the one offered by Handa Ka Funda – you can actually study on the go. Even if you are not comfortable watching a video online and/or solving a question on an app – you can easily use the commute time to improve your reading skills. Instead of spending the time on Facebook, Twitter, Instagram, or whatever you kids might be using these days – it will be a better idea to read a book. That will not only help you improve in Reading comprehension but will also help you improve you do better in the Group Discussion / Personal Interview / Written Ability Test part of the B-school selection process. So, once again, no – this is not a valid reason to quit your job. Try talking to the HR in your company. Their only job is not to organize ethnic day but also to take care of issues like these. Some of them would give you a 2-3 month unpaid leave instead of letting you go. Finding talent in today's day and age is hard. Training talent is costly. Letting go of someone looks bad on everyone and an HR would do whatever they can to avoid that from happening. If the above isn't possible then perhaps you are not left with any option and you would need to quit your job. You will be a minority. You will start on the backfoot during the interview. Can you handle that? 2. What if you don't get the expected score / expected college? You will not have a backup option and you would have spent a better part of a year without much to show for it. The job market is tough right now and it would only get harder in the days to come. You would be playing this game on 'extra-hard' mode considering that you were at home. People like to hire candidates who are in demand / who are already working at some hot-shot company. It becomes an easy decision for them to provide a salary that is 10% or 30% higher than the previous salary. On the other hand, it is lot harder for someone who wasn't working to find a job. Basically, the question is – do you have a back up plan?